Why put a warning sticker over the warning on this product? My curiosity got piqued by a can of deodorant with a sticker with a "flammable" warning placed where the text was evidently already flowed around it. Peeling off the sticker revealed another "flammable" warning. Why would one do this? One theory is that the warning is somehow not big enough, but the difference is small: 8mm vs 9½mm side length. Is there any chance the label pictogram is actually 10x10mm? 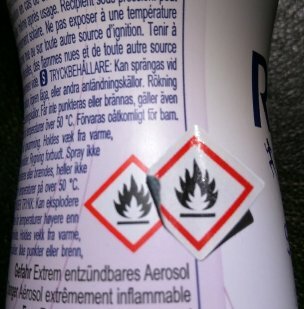 Guidance on Labelling and Packaging Version 2.0 - September 2016 states in section 5.2 (Size of the label and of the label elements) that for a package of capacity less than or equal to 3 litres, the pictogram (in this case the flammable hazard pictogram) must be not smaller than 10x10mm and if possible at least 16x16mm. It's likely that while the printed pictogram is not that much smaller than the label, that difference was enough to not quite meet regulations. There's also another other regulation that can come into play: "Each hazard pictogram must cover at least one fifteenth of the minimum surface area of the label dedicated to obligatory labelling information." These are EU guidelines, so it also depends where you are. Note: the linked document is only a guidance document produced by the European Chemicals Agency and the actual legally binding document, known as the 'CLP' is the 'Regulation (EC) No 1272/2008 on Classification, Labelling and Packaging of Substances and Mixtures'. Having said that, the UK Health and Safety Executive (HSE) still officially references the linked ECHA document 'for more information'. Not the answer you're looking for? Browse other questions tagged physical warnings product or ask your own question. Is the label orientation on this product a message from the manufacturer? How useful is this coffee cup “hot contents” warning? Where are the most optimal places to put laptop speakers? Default action for the “Do you want to leave the page?” warning? What is the difference between an alert and a warning message? Including info about the company on a product page? What is the ideal aspect ratio for product images? Why is the telescoping toilet paper roller preferred over a simpler solution? Is there any evidence of differences in e-commerce product quality perception around the world?